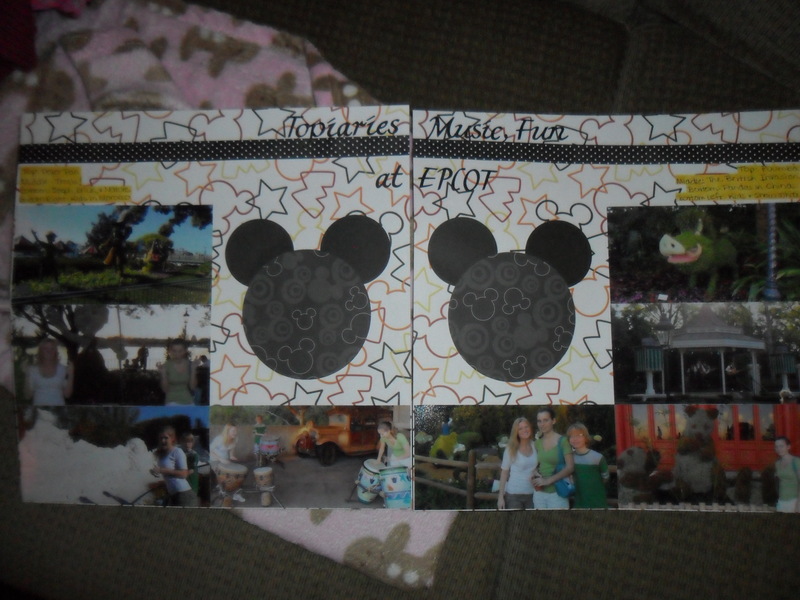 Today’s layout features some pictures from Disney World. I was on this trip with my husband and my brother’s family. I’m very thankful that we all went on this trip together. It was wonderful! These Mickey ears were super easy with CM’s custom cutting system using the circle templates. I also used CM’s Disney paper, ABC stickers, and paper ribbon. Thank you for looking! 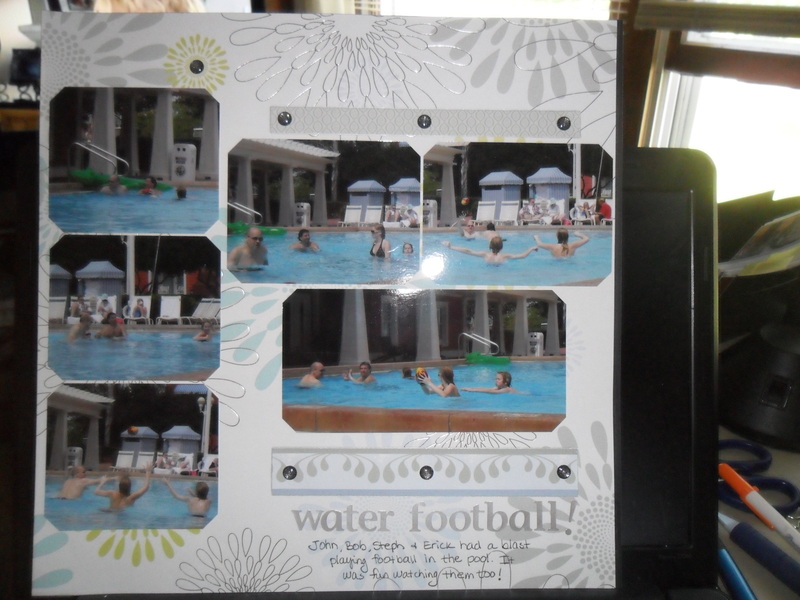 Today’s Mojo Monday post shows CM’s gorgeous Reflections paper with some fun water football photos. I also used CM’s Reflections embellishments. Thank you for looking! Today’s Mojo Monday layout shows some of my family members definitely with their Mojo on. 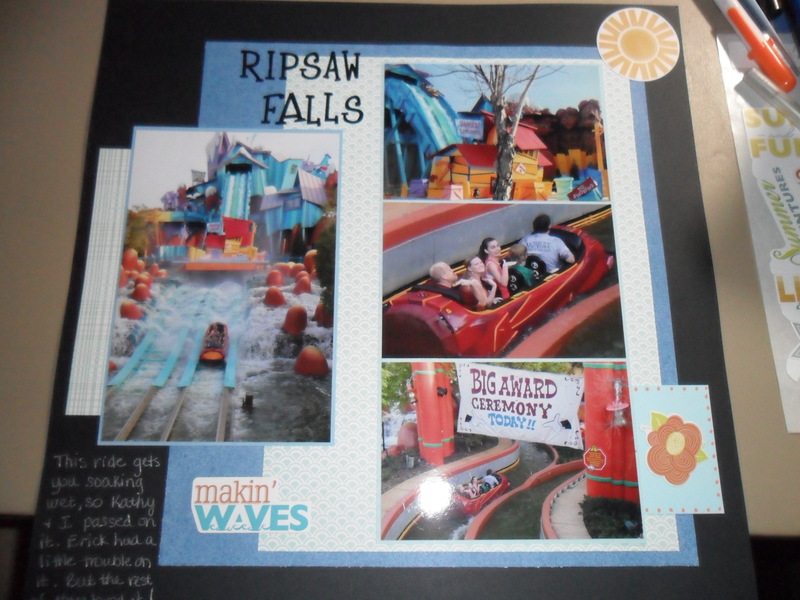 Anyone who will ride Ripsaw Falls at Islands of Adventure has my utmost respect! I rode it once – once – and honestly needed the spin cycle of a washer for my clothes when I got off it! You get torpedoed with water during this ride, so much so, that I lost my breath, and prayed to God that the ride would be over very soon. (pretty pathetic, isn’t it?) My husband, my little brother, my two nieces loved it. My nephew – not so much – I think he experienced what his Aunt Jane experienced – maybe it’s because we were both in the second seat??? Now, back to the layout… I used different shades of blues that I had that I had on hand, layering them, as the sketch indicated that was from the sketch class I took online this summer. I also used stickers with some orange to go along with the pictures. Thank you for looking! This was a fun layout to do… I used the rotary trimmer with the wavy blade. I love the blues, and I love staying at the Boardwalk! I need to get back there soon. Thank you for looking! 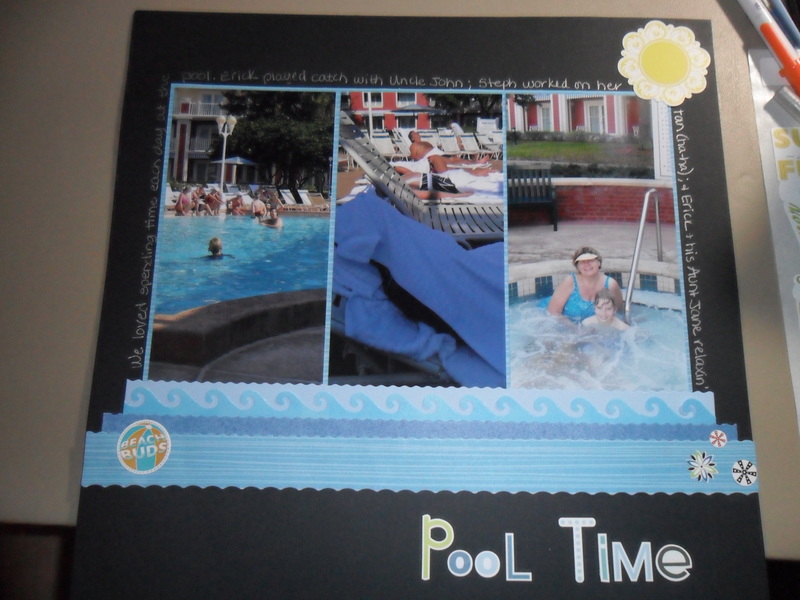 For this layout I used the border maker with the wave cartridge; also the rotary trimmer with the small wavy blade. This layout was from another sketch in the Sketch Class I’m been taking online. Thank you for looking! 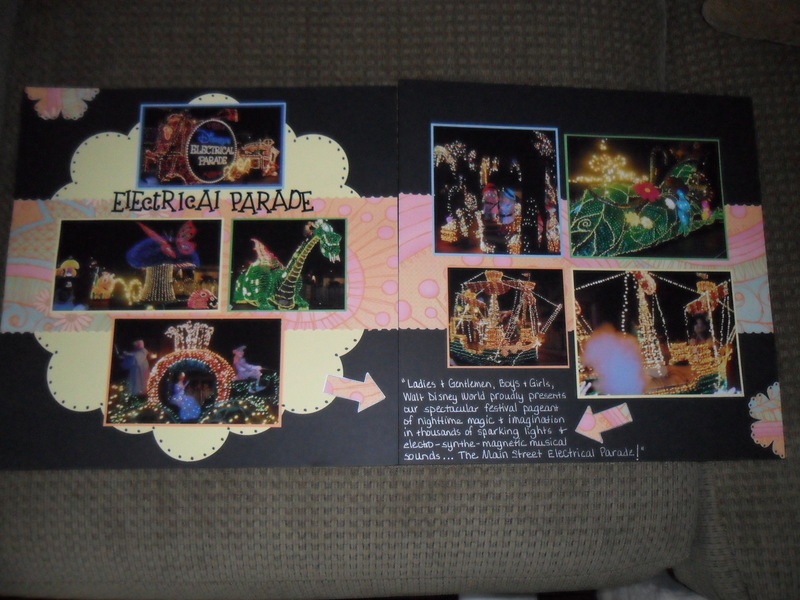 Today’s Warmhearted Wednesday post is warmhearted because I’ve always loved Disney’s Electrical Parade – ever since the first time I saw it with a certain 4 year old who thought it was the best parade in the world. Feeling Scrappy Sketch by Jayne Jones. This is a layout I made for a sketch class that I’m taking online. Have I mentioned that I love sketch classes? 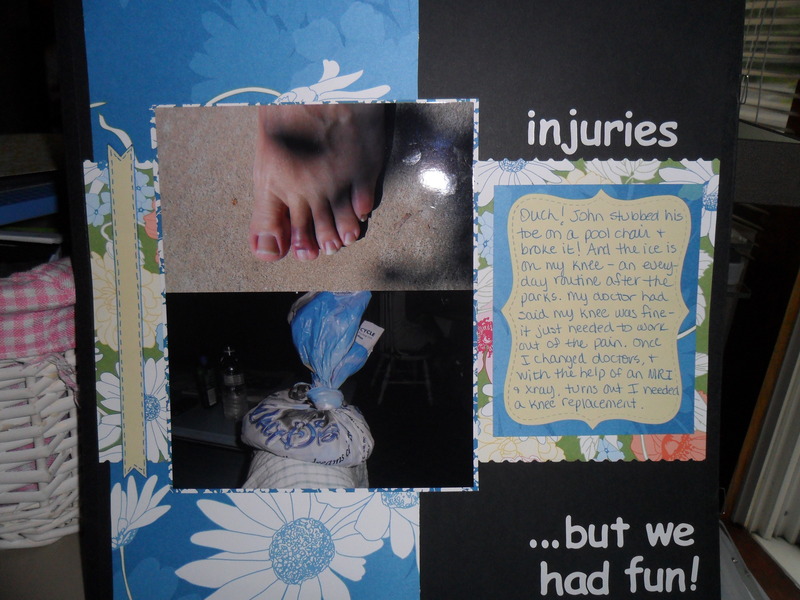 Anyway, I wasn’t even sure I wanted to scrapbook these pictures, but they were a part of our vacation, so I decided to go for it. I used CM’s rotary trimmer with the straight blade and the pinking blade; and also the big shot with the top note die. This is definitely outside the box for me, but I’m happy with how it turned out. Thank you for looking! Anyone who knows me knows that Disney World is one of my favorite places to be. The rotary trimmer and square punch with lots of different green papers make this layout super easy. 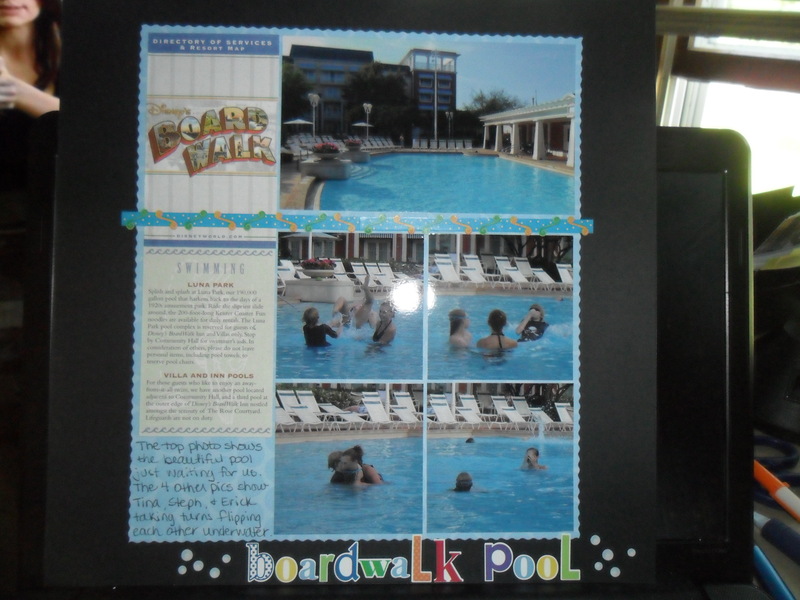 I also matted the photos to complete the page. Thanks for looking. 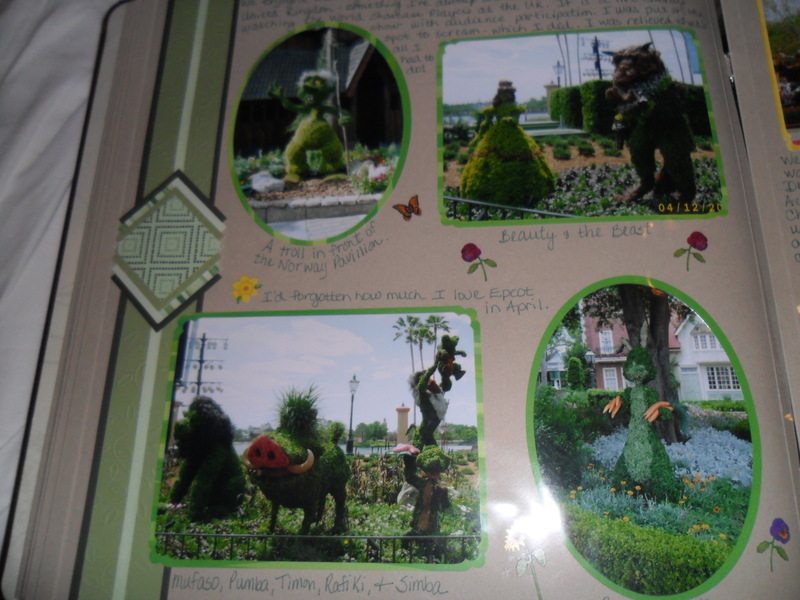 Every year Epcot has the Flower & Garden Festival and I just love being there during that time. 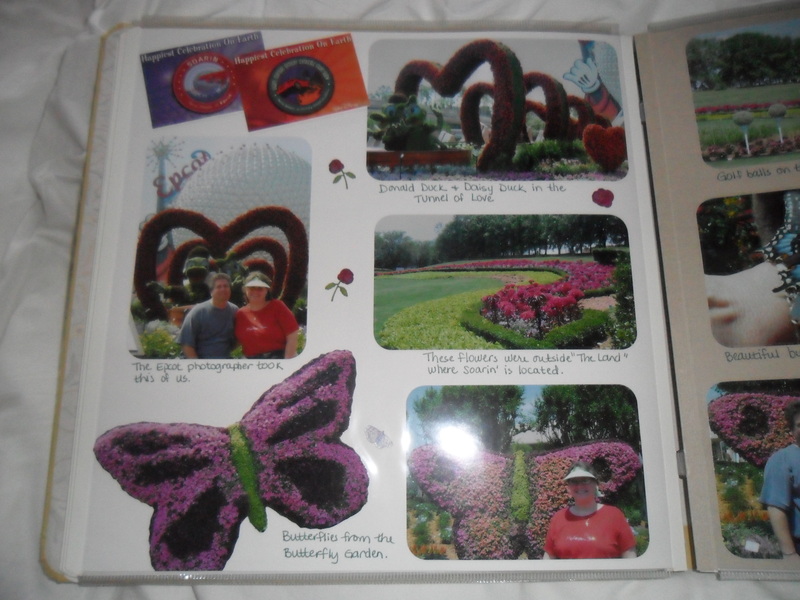 These pictures are so pretty, I didn’t feel they needed any decorative elements – the only thing I did was cut out the huge butterfly. I added our tickets and the page was done. Sometimes your pictures are so beautiful, you don’t need much else on your page. I cut out six squares in two different sizes – 1.25″ and 1″ squares. 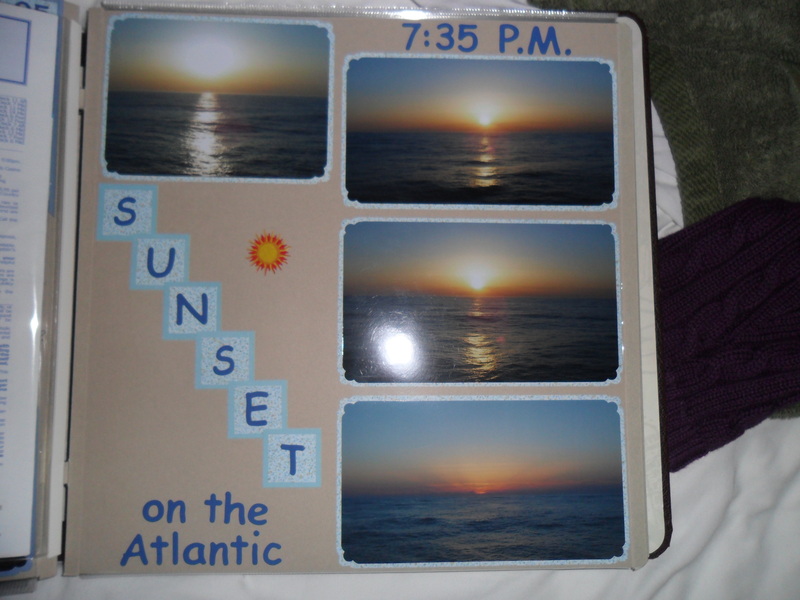 Layered them, then used ABC stickers to spell Sunset. I mounted the photos, and placed them sequentially. Gorgeous sunset off our balcony.